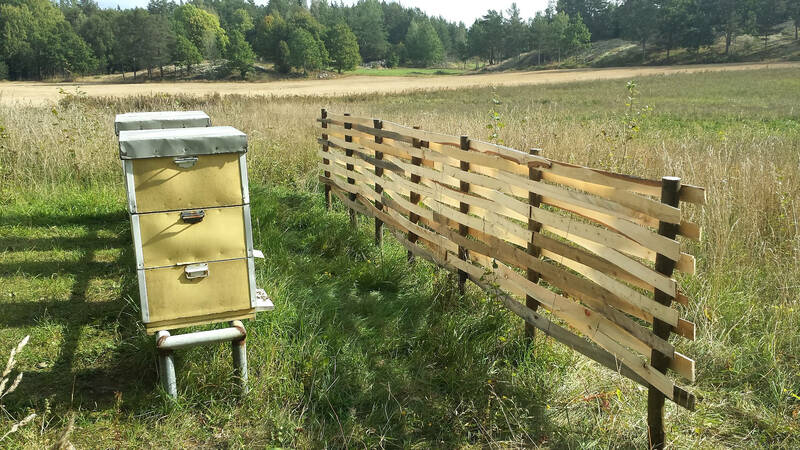 This entry was posted in Breeding, Elgon, Overwintering, Varroa level, Varroa reinvasion, Varroa resistance by Erik. Bookmark the permalink. you say the counting with alcohol wash was in october when the bees were broodless. Then why has a colony tested in october zero mites and later on after oxalic vaporizing 150 mites falling? Or was it not tested? It was end of row, so maybe reinfested? After being treated the year before they came out of winter with low mite numbers. Those mite numbers are still very low. I think all would have survived without winter treatments. Very good to monitor so you know not to endanger colonies by not treating. David: great management to place a windbreak! The 150-colony was not monitored with the bee shaker. The – tells you that. About half of the colonies were monitored in October. Why this colony had the highest number of mites may have been contributed by the fact that it was at one the end of the row. The colony at the other end had fewer mites. It was a split with one of the new queens. Yes, the numbers are all quite low actually. I think all numbers under 1000 after a treatment like this are low. There is though the fact that in many places where beekeepers are treating two, three and four, five times a year to get really low numbers of mites, it seems the immune system are so damaged colonies are dying anyway. So for such colonies 1000 mites is a high number! Also these many treatments with rising virus levels may be an answer to why there are more queen problems as Bill is reporting. I wonder why here in USA now that acid vaporization is used everywhere, why queen events are also very high here as well? I really think acid treatments are harming the queens which in turn causes the colony to abort their queens. 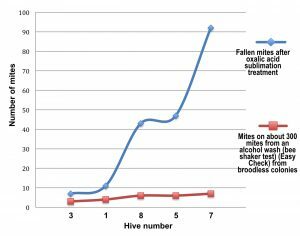 Seems in other countries, beekeepers have colonies with several year old queens despite the beekeeper gassing their colonies with acid vapor. Thanks for your excellent thought proviking blog. Yes, beekeepers are looking for new treatments all the time. It tells me they are not really satisfied with those they are using. They are crutches all of them, only to be used until they are getting rid of. Then the microbes can come back to a healthy status. I suspect virus levels have risen so high in the colonies due to more treatments than just oxalic fuming, or many fumings a year. David has fumed most of his colonies once a year with 3 grams. And yes, I was surprised to see that one of the original Elgons with him was still there 4 years old, and maybe hopefully will be there as five year old in spring. the formic acid makes the queen´s problems, the oxalic vaporizing is not as dangerous, it´s rather dangerous to the beekeeper if he is not protecting himself. Oxalic seems to kill microorganisms though, mostly fungi, which the bees need for their digestion. Myself, I can´t understand anyone monitoring for mites by a treatment. The moment the treatment is used it´s not possible to evaluate the mite resistance or tolerance. State is, they are a treated colony. The cow is on the ice already then. No resistance breeding possible except use the bees for better queens. But treatment free colonies, hopefully at least two seasons and one winter, better two winters free of chemicals, are necessary in a project of resistance breeding in my eyes. And everyone using resistance bred queens should go on with the selection, no matter how the genetics are watered down by the environement. 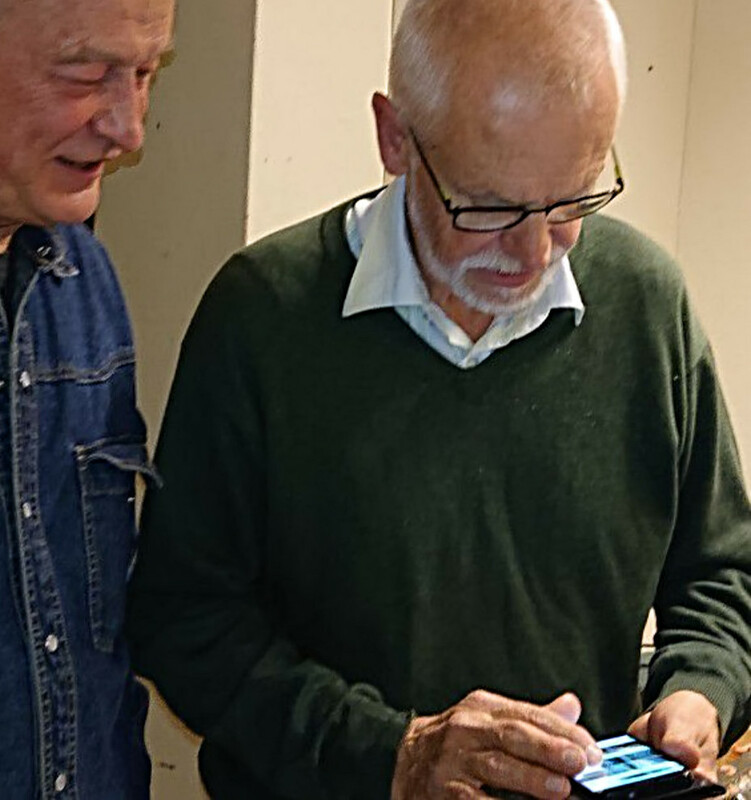 I´m with Erik, checking for mite numbers in spring and again in late summer to see the numbers rise or not. If the bees can hold the mites at bay throughout the season and show no virus disease or not many sick bees, and mite numbers stay the same, the defense is present. I learned that in sweden, listening to him. Coming out of winter strong or weak is a sign too. And it´s probably best to do the alcohol wash when the colony is strong and can replace the bees quickly. Sticky boards can be used all the time without killing bees. thanks for the correcting comment to the statistics. I´m fascinated by this story. 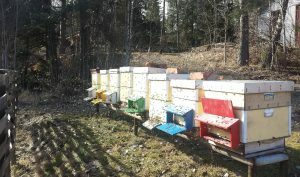 With only one OAV treatment David keeps alive his bees in a treater´s crowded area. My personal belief is the elgons have the grooming trait added to the VSH. 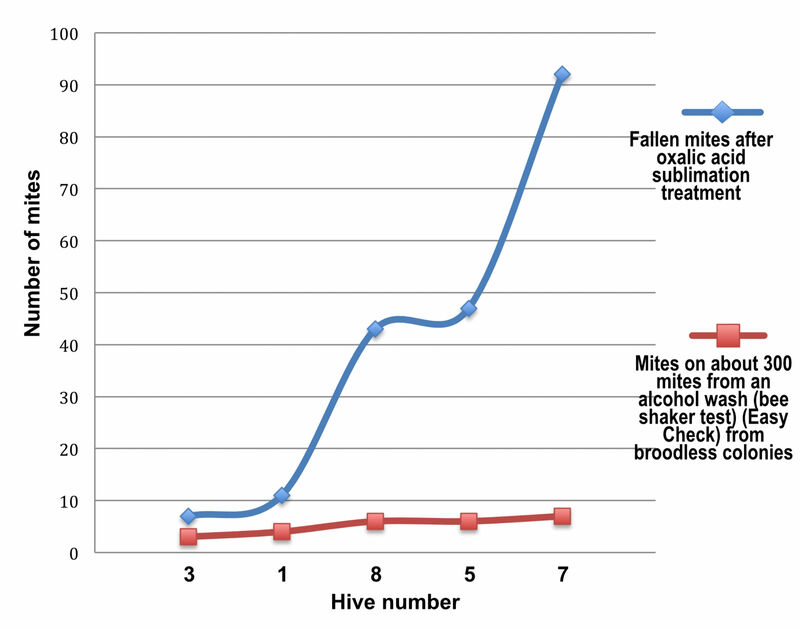 The grooming behavoiur may be triggered by movements and behaviours of the infested bees and start a learning behaviour which leads to an epigenetic behaviour. Perhaps coming from the monticola influence? The VSH ( which I see in my hives done) might be decreased by treatments which disturb the smell of the interiour pheromones or by the stress while treatments are done, or with splitting to much. I think the expression of this trait is influenced strongly by beekeeper´s managements. The grooming behaviour might be increased by treatments, because of the stress of cleaning the hive from chemicals ( I saw my bees do cleaning in a desperate way when I put in the thymol ,and they propolised the pads) or perhaps it is not influenced much. Grooming is accelerated by sugar shakes too, it seems. Some people keep alive their hives just doing sugar shakes now and then in season. The grooming trait is difficult to monitor and not of interest to many, the VSH is much more scientifically checked and bred for. I only know of one breeder who breeds for grooming and mite biting, Alois Wallner. 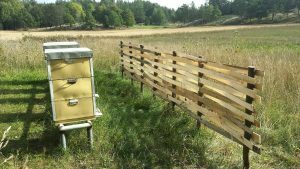 Well, my friend Stefan who keeps his elgon mutts treatment free for years right next to his carniolan treated hives is an example to me because it works for him too. No reinvasion if he treats thoroughly. And so far his mites are not getting more virulent and his elgons survived since 2013 completely without treatments and without drone cutting. I will keep you updated about that.